You may be wondering why I am giving you this account. Well, I don’t know really. A bunch of things happened and I’m just putting them in order. I’m doing it for myself. You are just a construction—you’re helping me to put things in order. You are my fictional audience and as such, I appreciate you very much. I figure when I finish, I will throw this out. If they make you put on a suit, it’s because they are going to do something horrible to you. I guarantee it. Getting older is—you think you are getting your way and you think you are getting your way and you think you are getting your way and then you are old and it turns out you didn’t get your way. 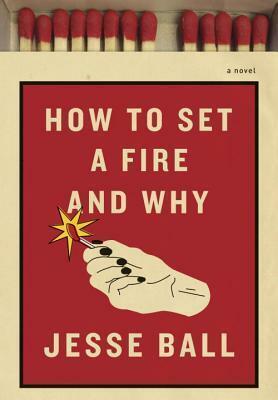 Ball writes How to Set a Fire with the feel of a diary. Lucia shares her thoughts without flourish and is not one to wallow. Life has been tough recently, with the death of her father, her mother being institutionalized and having to live with her elderly aunt in a converted garage. As she tries to manage these realities she’s presented with two opportunities. One, to attend a non-traditional school for gifted teens and two, to join a secret arson club. Not even a choice for an adult, but for a girl who’s confused and doing the best she can to make sense of her circumstances, the allure of rebellion against the established path is too strong to ignore. The events and situations are not the reason to read How to Set a Fire. Lucia is. In all her stone-cold, tender, hot-headed confusion there is a young woman being pushed past her ability to cope. Do circumstances bring out the worst in her? Yes, but through it all Ball infuses her with such spirit that not only is she relatable, I wish I knew her. She is capable of making her own way, but it won’t be easy because she doesn’t respond to the world the way the world wants to be responded to. And that makes her all the more interesting. This book doesn’t look at all to be what I thought it was. It really looks to be better, and I already had it on my radar. I think it’s one I’d like because of the way you described the coping abilities (or lack of) of the young woman. I tend to gravitate to those storylines, lately. I’m the same way! Even though it’s a different setting and story this is reminiscent of The Girls and Dear Fang- teenage girls trying to figure out life. I’m on a kick of fantastic teenage girl protagonists, so I’ve added this one to my July list! Going to give it a shot. And – yay for the successful file transfer I see!! Yes- all finished, except that they transferred the same set of duplicate files, but I’m not going to think about that until August. I just saw this in the window of my favorite book store and was wondering. Will definitely add it to my list! I’ve been seeing this release everywhere lately and I think you’ve tipped the scales – I definitely need to check this out!